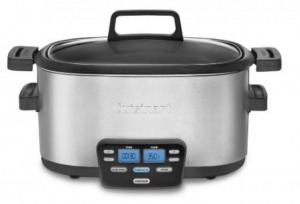 Let me tell you the reasons why I think the Cuisinart 3-In-1 Cook Central Multi-Cooker, Slow Cooker and Steamer is one of the best slow cookers out there and why you should buy one—fast! Probably the most compelling argument why you should buy the Cuisinart 3-In-1 Cook Central Multi-Cooker is its multi-mode cooking. 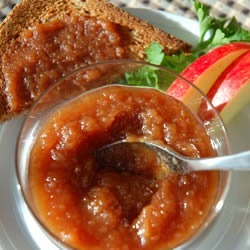 Aside from being a slow cooker, it can steam as well as brown/sauté meals. This feature has been the main reason why I bought this product. 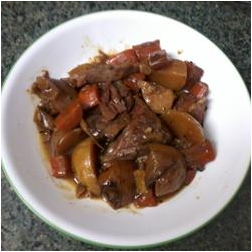 It can for example, sauté or brown food in the pot (with temperatures as high as 400 degrees) if a recipe calls for it before putting additional items in the slow cooker. You can use the slow cooker the same way as a sauté pan. After the food has been sautéed, you can just switch the slow cooker mode, cover it, and then leave and do other chores. This makes food preparation and cooking super easy for me, especially since I have no one to help me with. Another wonderful setting in this product is its steam setting. The Cuisinart 3-In-1 Cook Central Multi-Cooker has a steam rack for hoisting the food you are steaming off the product’s bottom. You can then put water and steam your meal, making it a healthier choice because it keeps the food’s nutrients more. Goodbye Big Mac, hello steamed salmon! Because it has many uses, the Cuisinart Cook Central 3-in-1 Multicooker saves you a lot of time cooking as well as money so you do not have to buy food from restaurants or fast food outlets anymore. Another thing why I love the Cuisinart Cook Central 3-in-1 Multicooker is the fact that it has programmable cooking functions, making it easy for kitchen amateurs like me to cook food (up to 400 degrees) without the danger of overcooking it—or worse, burning it and the whole house down! You want to sauté or brown meats? Or you want steam peas and carrots? Or you want a slow-cooked rest? Just use the Cuisinart Cook Central 3-in-1 Multicooker’s Cook Central to pick the setting and cook right away! For example, I can have steamed vegetables on Mondays and Thursdays, on other days, I want to eat sautéed meat, and on weekends I want to feast on a roast or stew—it’s no problem with the Cuisinart Cook Central 3-in-1 Multicooker. It has everything I need when I want to cook and eat something from my own kitchen. 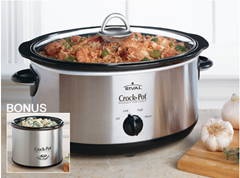 Its multifunctional functions allow you to slow cook foods that need slow, long simmering cooking such as stocks and stews. You’ve got a tough meat? 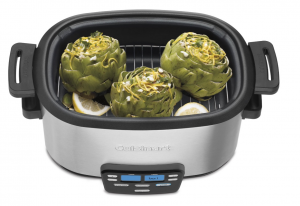 It’s no problem with the Cuisinart Cook Central 3-in-1 Multicooker’s slow cooking function. Its cooking and temperature settings (high, low, simmer and low) allow you to make delicious dishes in no time. The “Keep Warm” mode assures a warm food that is ready to eat anytime you want. For example, I want to eat something after work. I can roast something, go to work, and when I come home, I am assured I have something delicious to eat. This makes my bachelor life more comfortable. The Cuisinart Cook Central 3-in-1 Multicooker is so ea sy to clean—another extra benefit for me. Its parts are easy to clean in a dishwasher. So if you have no other people to rely on, this comes as an additional plus. The Cuisinart Cook Central 3-in-1 Multicooker has a cool-touch handle, allowing you to comfortably handle the slow cooker. The Cuisinart Cook Central 3-in-1 Multicooker has the following dimensions: 12 x 19 x 9.5 inches. Its weigh is around 16 pounds. If you ordered the product online, the shipping weight is around 19 pounds. The Cuisinart Cook Central 3-in-1 Multicooker costs around $150.